Will Trump Make or Break an Immigration Deal? Senate Democrats have invested a lot in the opportunity they will have beginning this week for a free-flowing debate on immigration policy: it was the relatively small price they demanded for abandoning a government shutdown, which was originally supposed to produce firm protections for Dreamers. 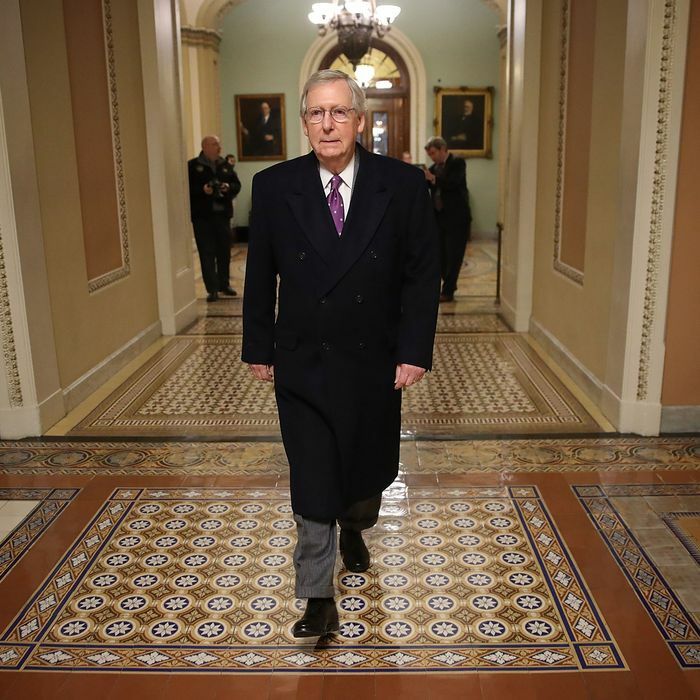 Mitch McConnell has promised a wide-open series of votes on various plans and amendments to plans, with anything that can meet the usual Senate threshold for passage of major legislation of 60 votes being fine with him. But as we learned in 2013, Senate passage of an immigration bill doesn’t mean much so long as the majority party in the House isn’t interested in going along. Add in a president who has pushed the immigration debate well to the right and you don’t really have a formula for letting Senate pragmatists cut a deal. McConnell himself has complicated the process and revealed the underlying dynamics by suggesting he won’t support a bill that doesn’t have 30 Republican votes. This is a sort of ad hoc version of the House GOP’s famous “Hastert Rule,” whereby the speaker won’t bring up any legislation that a majority of Republicans don’t support. And as a matter of fact, that’s the rule Speaker Paul Ryan has very specifically pledged to observe on any immigration votes in the House. Hours before Congress voted to begin debate on Monday night, McConnell suggested that Trump’s own very conservative proposal might be a “fair compromise.” That’s a pretty good indicator of how far apart the two parties are on this subject. For all the talk of a free-flowing debate over immigration policy, any actual “deal” would involve legislation that can command the support of 30 Senate Republicans, 30 Senate Democrats, 120 House Republicans, 97 House Democrats, and Donald J. Trump. That is a stretch, to put it mildly. The only immigration bill at present that has the support of a majority of House Republicans is Bob Goodlatte’s legislation that not only includes a variety of provisions unacceptable to virtually any Democrat (including cuts in legal immigration and stepped-up deportations far from the border), but offers current DACA beneficiaries only a renewable three-year “legalization” option (with no guarantees and no “path to citizenship” at all) and the broader category of Dreamers nothing at all. The vast majority of Democrats in both chambers are insisting either on the original DREAM Act (which has no provisions attractive to immigration restrictionists) or on a much narrower “deal” than House Republicans or the administration are proposing, in which the extension or expansion of DACA is traded for border-security money. Meanwhile, Senate Republicans outside the hard-line restrictionist band led by Tom Cotton, David Perdue, and Grassley are all over the place. In other words, the math for a successful compromise is just impossible, and it’s made worse by the fact that Democrats are already smarting from criticism for failing to go to the mat for Dreamers when they could wield a government shutdown as leverage, and Paul Ryan can’t undercut the Goodlatte bill without endangering his gavel. The big and crazy wild card, of course, lives in the White House. Trump’s most recent posture has been to prospectively blame Democrats for a bad fate for Dreamers because of their virtually unanimous resistance to his own proposal. At a time when Team Trump seems most preoccupied with stirring up the GOP’s conservative base, it seems unlikely that he’d suddenly accept a deal without provisions that are absolute poison for Democrats. Making the whole situation even murkier is that the fact that the sword of Damocles hanging over DACA beneficiaries — the original Trump March 5 deadline for the end of his earlier cancellation of DACA — has been suspended indefinitely by a federal judge (whose ruling may or may not be reviewed by the U.S. Supreme Court, to which the administration has appealed to confirm the president’s power over DACA). You never know what this president might do, but at present the debate in Congress appears headed nowhere other than possibly some mini-deal that would postpone the deadline for the loss of DACA protections for some time — maybe a year — in exchange for something conservatives and the White House want. Trump has made it reasonably clear he won’t offer any sort of additional Dreamer relief unilaterally, so it would have to be a legislative deal or a congressionally blessed executive action. That approach might make it possible for him to do something and pocket whatever concessions he can without breaking faith with “the base” via some real “amnesty,” while keeping up pressure on Democrats to deliver for Dreamers at a cost they may not currently be willing to pay. No matter what happens during this week of Senate debate, it’s reasonably clear Trump can kill any prospects of a deal with just one tweet hardening his position or threatening Republican rebels. And he is absolutely the only one who could give 30 Senate Republicans and a majority of House Republicans the cover to support a deal that can get through both Houses. At this point any real progress on immigration (other than the aforementioned mini-deal) is a long shot, so the talkathon in the Senate, however interesting and healthy, may represent little more than wind in the sails of a ship going nowhere.